The yo-yo boom in the USA, from approimately 1997 to 2001, saw the rise of yo-yo-related memorabilia, not just yo-yos exclusively. From figurines and Christmas ornaments to dolls and sculptures, trucks, drawings, posters, books and more, the wide variety of collectibles added to the unique story of the boom in North America. In 2000, the "Life Is Filled with Ups and Downs" figurine was released by Enesco. It was designed by Priscilla and Glenn Hillman and licensed by Enesco. 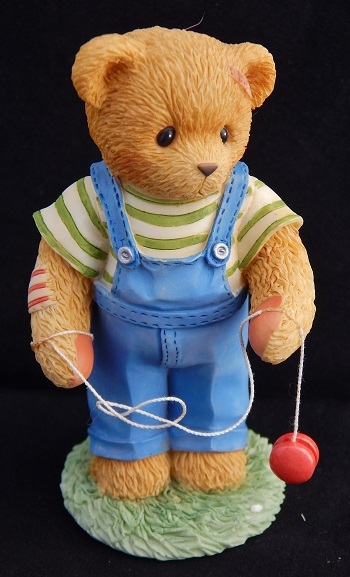 It depicts Calvin the Bear, befuddled with his yo-yo. Height is 3¾ inches. Original retail price: $17.50 US.